Fridays mean we take some time to showcase our readers' favorite Royal Caribbean cruise photos. It is a kind of "virtual escape" to a Royal Caribbean cruise, and the perfect way to kick off the weekend. We begin with this photo of Radiance of the Seas in Moorea, taken by Pascal Everard. It is a beautiful photo from a Transpacific cruise and I love it. 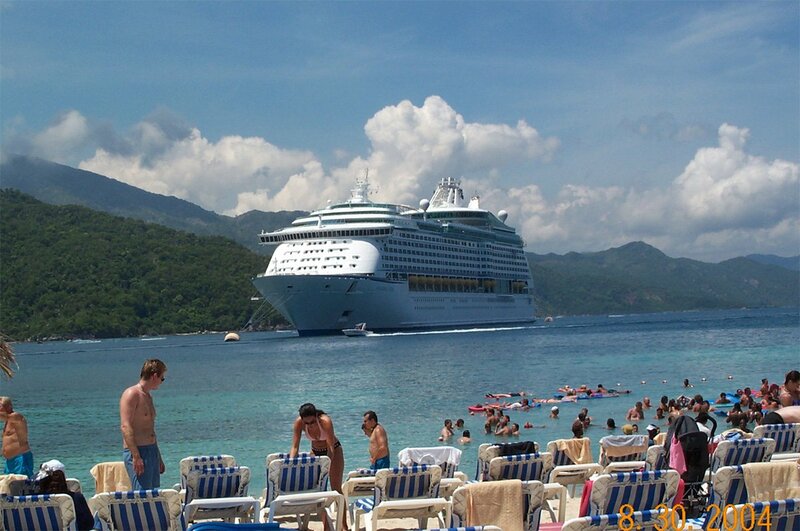 Next is this photo of Labadee, by Haley Mills. It is a shot of sunrise as her ship was pulling into Labadee. George Alcázar took this photo of a sunny day on Harmony of the Seas. Next is a photo of Sydney harbor, as soon from Explorer of the Seas. Jen took this photo in March 2017, and even on a cloudy day, Sydney is lovely. Paul Morrison took this photo of his partner, Gosia, "sandwiched" between Vision of the Seas and Brilliance of the Seas after a day at the Ephesus ruins. Here we have Oasis of the Seas and Empress of the Seas in Cozumel, taken by Bob (aka Sailor_to_Cruiser). Our final photo is by David Donnelly, taken at the top of the hill in Villefranche-sur-Mer. C'est manifique. Thank you to everyone for sharing their lovely photos with us this week. As always, we welcome all of our readers to share their favorite Royal Caribbean photos with us by using this form. Have a great weekend! We love any opportunity to take a virtual escape on a Royal Caribbean cruise, and that is why every Friday we share our readers' favorite Royal Caribbean cruise photos. It is a showcase of cruising fun, and you are invited! Without further ado, we present this week's edition of Friday Photos. Enjoy! Our first photo is of Freedom of the Seas docked in Costa Maya, taken by Ken in March 2017. Next is a photo of Columbus Cove in Labadee, taken by Tommy Koth. Stephanie Anderson sent in this photo of the brand new floating bar in Labadee. 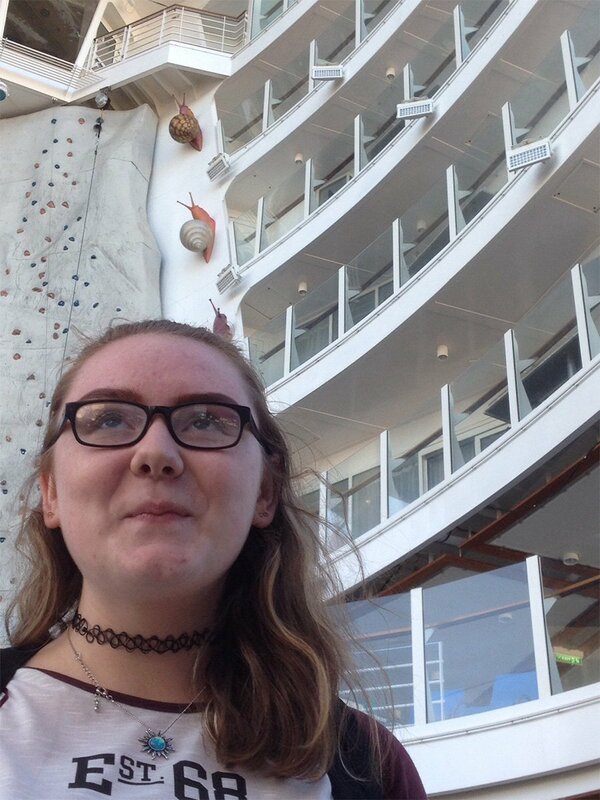 Cristina Myers sent this photo of Sarah looking over the Royal Promenade on Liberty of the Seas. Irina shared this photo from Navigator of the Seas, taken in March 2017. Bill Bartman took this photo from his cabana on CocoCay, with a perfect view of Anthem of the Seas. We round out this week's edition of Friday Photos with this photo of Jimmy Burns' 4-year-old daughter, Madalynn, excited to watch the ocean on her first cruise. Thank you to everyone who shared their photos this week, and we invite everyone to send in their favorite Royal Caribbean photos by using this form. Are you ready for a virtual escape to a Royal Caribbean cruise? 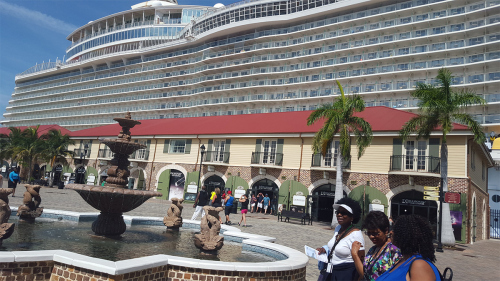 Every Friday we share our readers' favorite Royal Caribbean cruise photos in a showcase of why we love going on Royal Caribbean. We begin this week with a photo by Tina Moore in Puerto Rico, while sailing on Freedom of the Seas. Here is a lovely shot of the beach in CocoCay by Justin. He took this photo after taking the first tender to the island, and shots like this are worth getting up early! Keith Davis sent in this photo of the sunrise, just as Freedom of the Seas was arriving in Labadee. This is such a beautiful photo! Our next photo is from Anthem of the Seas, with Gigi the giraffe "admiring" the sunset. Marjolaine took this photo, and there are never enough sunset photos to go around! Richard Weiss shared this photo of a friendly wave from an officer on Freedom of the Seas, as Harmony of the Seas passed by in St. Martin. One of our favorite photographers, Dave Rimington, sent in this photo of Navigator of the Seas in Bonaire. Love the colors. 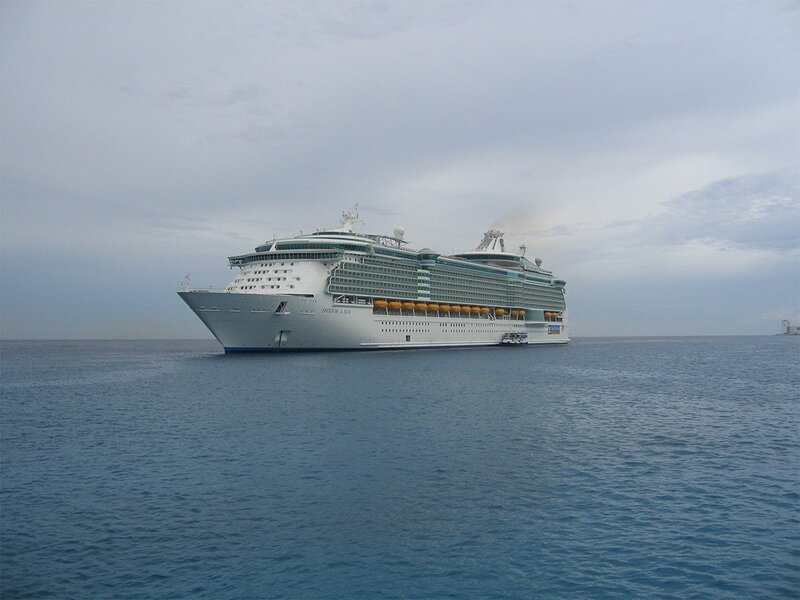 Our final photo this week is from Henry H, and it is of Explorer of the Seas sailing away from Cartagena, Spain. Thank you to everyone who's photos were featured this week, and if you want to share your best Royal Caribbean cruise photos, you can send them in via this form. Have a great weekend! 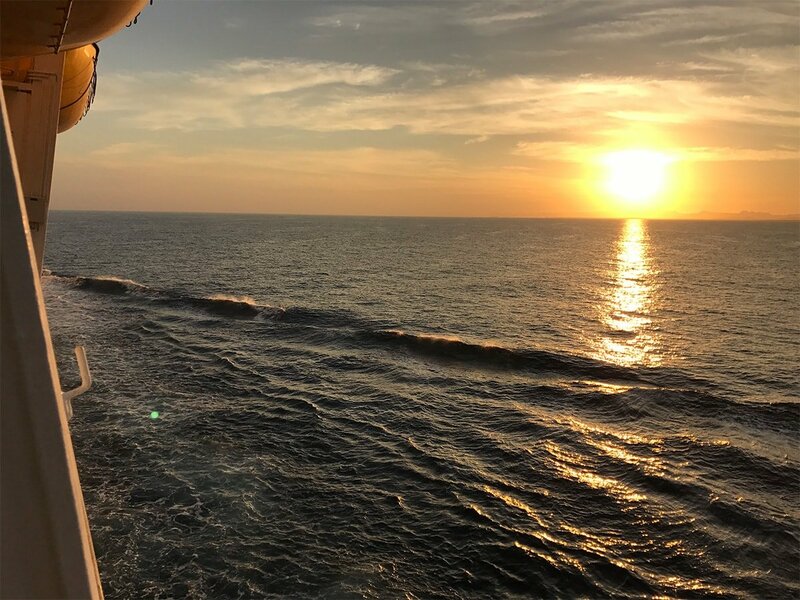 Friday is here and that means two things: the weekend is beginning and we have some terrific Royal Caribbean photos to share from our readers. Each week, we invite our readers to share with us their favorite Royal Caribbean photos in a kind of virtual escape for everyone. We begin Friday Photos this week with a photo by Crystal taken on Labadee, looking out to Harmony of the Seas. Just another day in paradise. Mike Wagner took this photo from the east coast of Cozumel. He rented a jeep and explored the east side of the island while on an Oasis of the Seas cruise. RBRSKI sent in this photo of the family's New Years cruise, which was on Independence of the Seas. They had a corner aft balcony and were definitely in the holiday mood. Speaking of Independence of the Seas, here is a photo by Anne M. from March 2017. Few things are as calming and beautiful as the wake from a cruise ship on the ocean. We are headed back to Labadee for this photo by Denis Beauchemin, and it is also of Harmony of the Seas docked in Royal Caribbean's private destination. Looks like it was taken from an over the water cabana at Nellie's Beach. Matthew Reed sent this photo of Harmony of the Seas and Freedom of the Seas docked next to each other in St. Maarten. Our last photo this week comes to us from Emily Knab, and it is of Liberty of the Seas arriving in Roatan, Honduras. The start to another weekend has arrived and we like to kick off our Fridays with our readers' favorite Royal Caribbean cruise photos! We begin with this week with a sunset photo from onboard Anthem of the Seas, taken by George Alcazar. I really like the angle of this photo, and how the sun fits in perfectly with the jogging track. Bob Hoenig took this photo of Rhapsody of the Seas from his balcony on Harmony of the Seas while in Palma de Mallorca. If you are looking to unwind, try this strategy by Denis Beauchemin. He snapped this photo while on his Harmony of the Seas balcony, while in Labadee. Check out this beautiful sunset photo by David Berenbaum from his Owners Suite balcony on Rhapsody of the Seas. This was taken while leaving Tampa Bay at the Sunshine Skyway Bridge. Here is Harmony of the Seas next to Freedom of the Seas in St. Maarten, taken by Justin. Tina Moore shared this photo with us of three generations enjoying their Freedom of the Seas cruise. Family cruising is what makes for such great vacation memories! Our final photo this week is from Bob Carpenter, and it is of the AquaTheater just after sunset. Thank you to everyone for sharing photos with us this week. 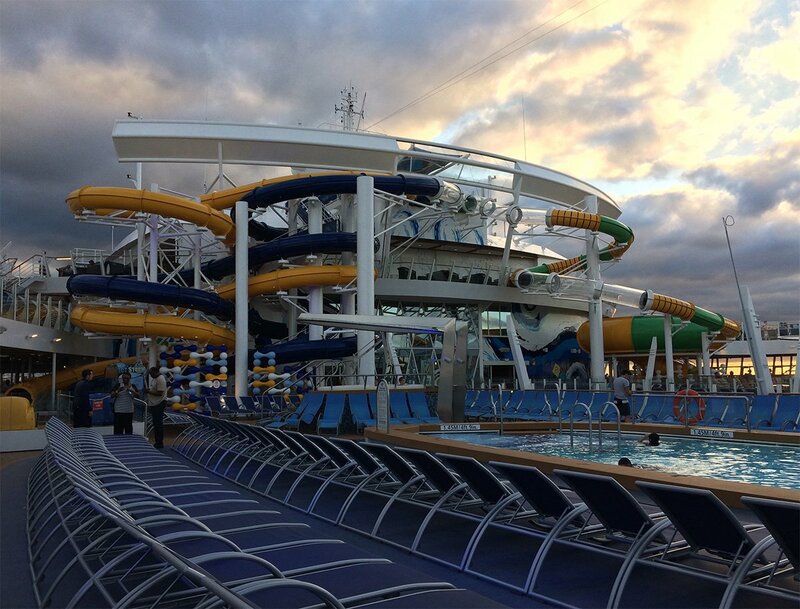 If you want to share your best Royal Caribbean photos, use this form to send them in! We kick things off this week with a throwback photo by Ken of Voyager of the Seas in Labadee before there was pier. Does anyone else remember visiting Labadee by tender? Jason Nolan sent us this photo and titled it, "wondering what is behind me". After a few seconds, I think you will understand too! 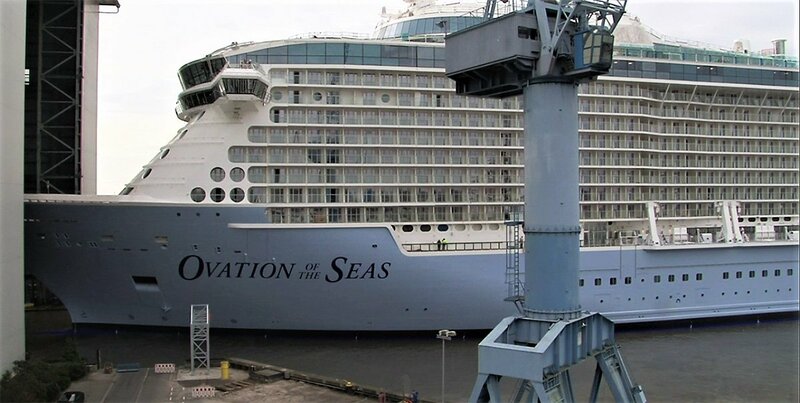 Next we have a photo of Ovation of the Seas being floated out at the Meyer Werft shipyard, taken by Thomas Lemmer. Can you believe it has been just about a year since this happened? 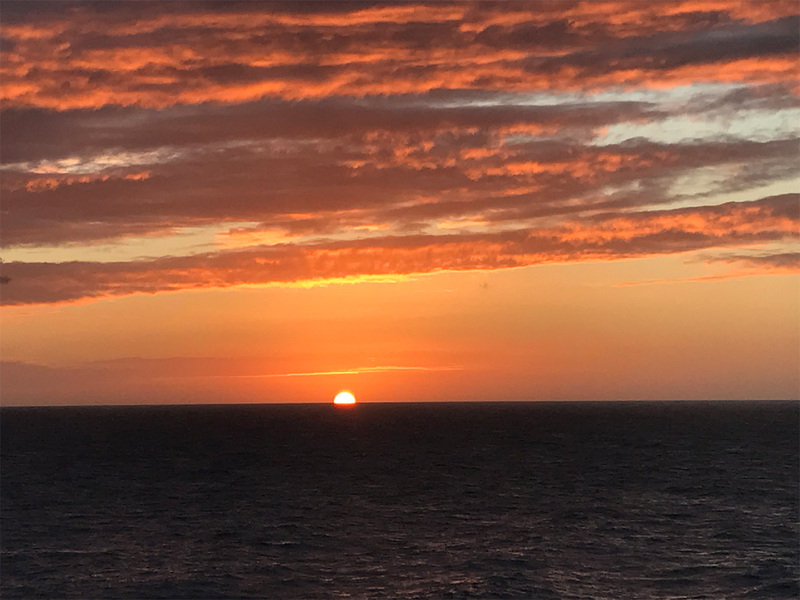 Ron Hiller sent in this photo of a perfect sunset from aboard Navigator of the Seas. Love it! I like Christopher Johns-Klein's style as he enjoys sailaway from an aft balcony on Rhapsody of the Seas. 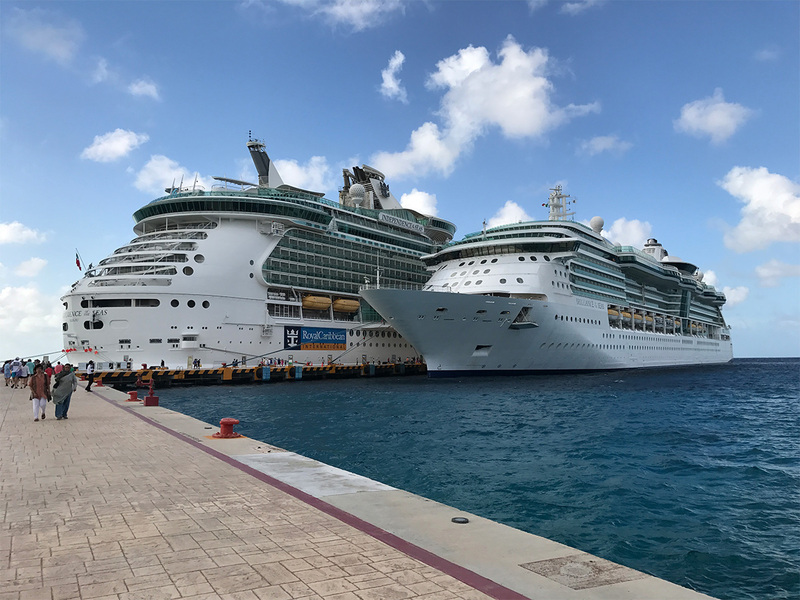 Check out this photo by Jordan Pin of Harmony of the Seas and Freedom of the Seas docked in Cozumel. 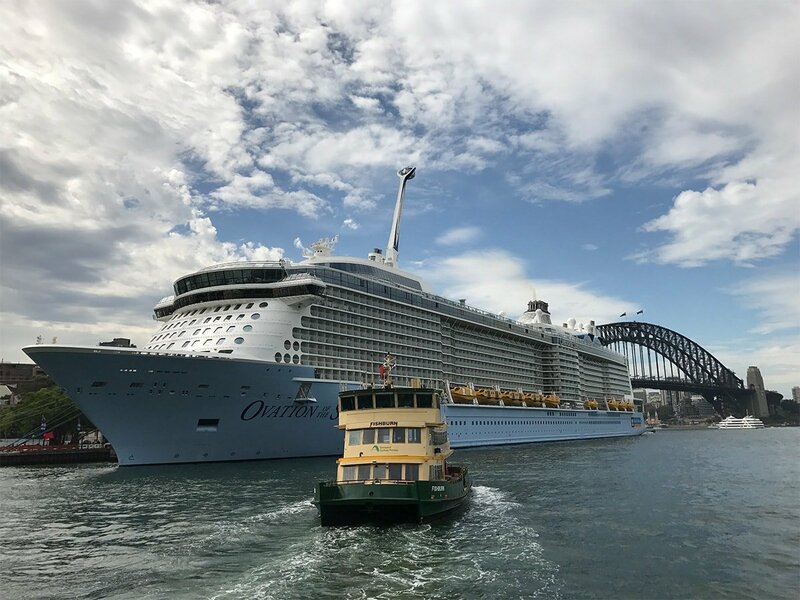 We wrap up this week's edition of Friday Photos with this shot of Ovation of the Seas in Sydney harbor, taken by Clayton Powell. Love how he got the bridge in the background. Happy Friday and welcome to the start of another great weekend! Each week, we celebrate the beginning of the weekend with our readers' favorite Royal Caribbean photos that they submitted. These are fun shots of ships, ports, cabins and sunsets, and it helps put us in the "cruise mood", even if we have no cruise in our future. Our first photo this week is from Ken, and it is of Freedom of the Seas anchored in a bay. It is a great wide-shot of this fabulous ship. 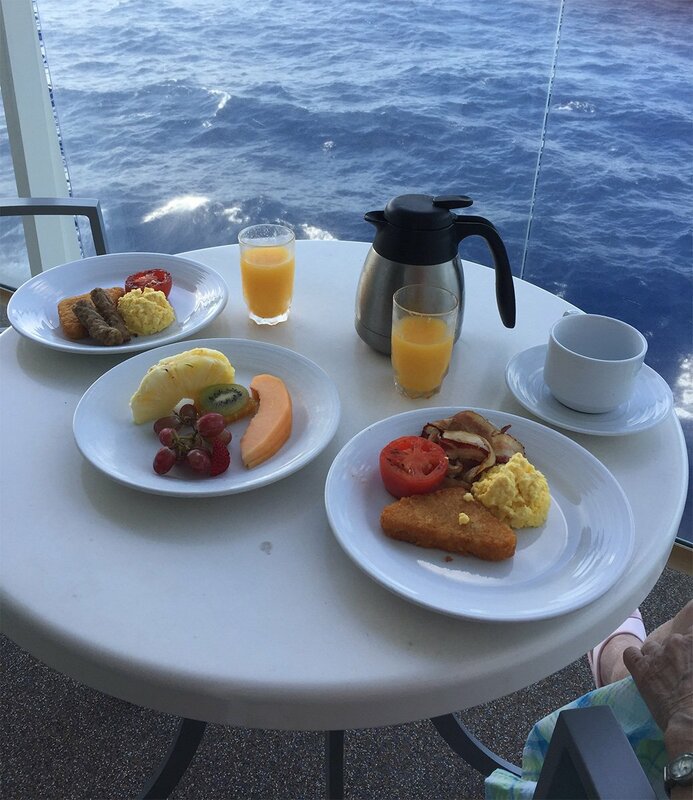 Next, is a photo by Becky Bowen of enjoying breakfast from the comfort of her balcony. She took this photo on Allure of the Seas and I have to agree that this is a really fun way to enjoy a meal while on a cruise. 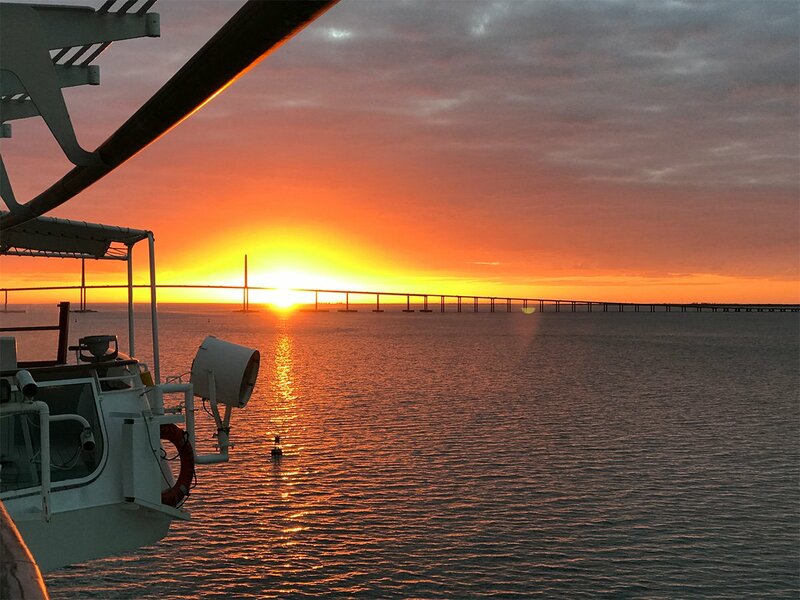 Check out this sunset photo that David Berenbaum took from his cabin on Rhapsody of the Seas going under the Tampa Bay Sunshine Skyway Bridge. Just beautiful! 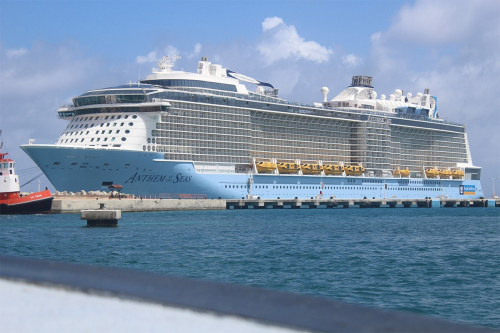 Joseph Daisley shared this photo of Anthem of the Seas in St. Maarten. I often forget that the Quantum class ships have that light blue hull color, and it looks great in this photo. 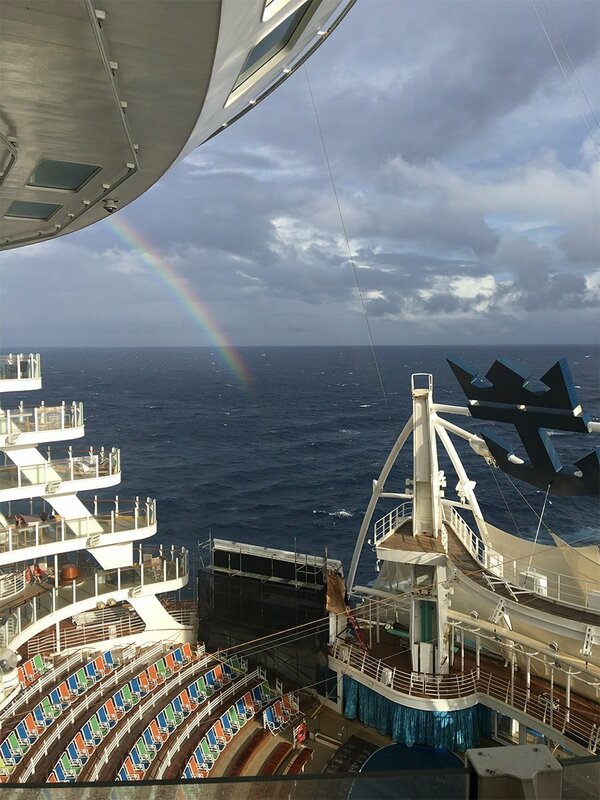 Nick Martini captured this photo of a rainbow, as seen from an AquaTheater suite on Oasis of the Seas. 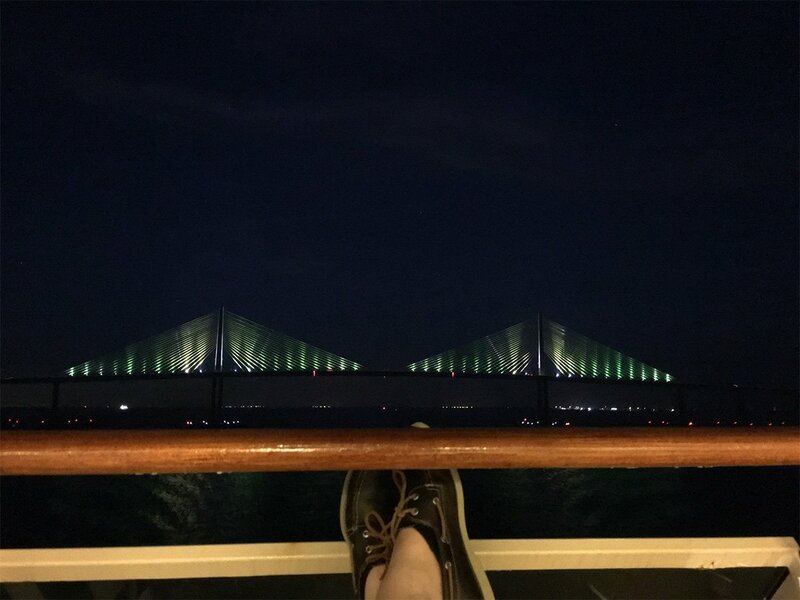 That is one heck of a view to enjoy on a cruise! 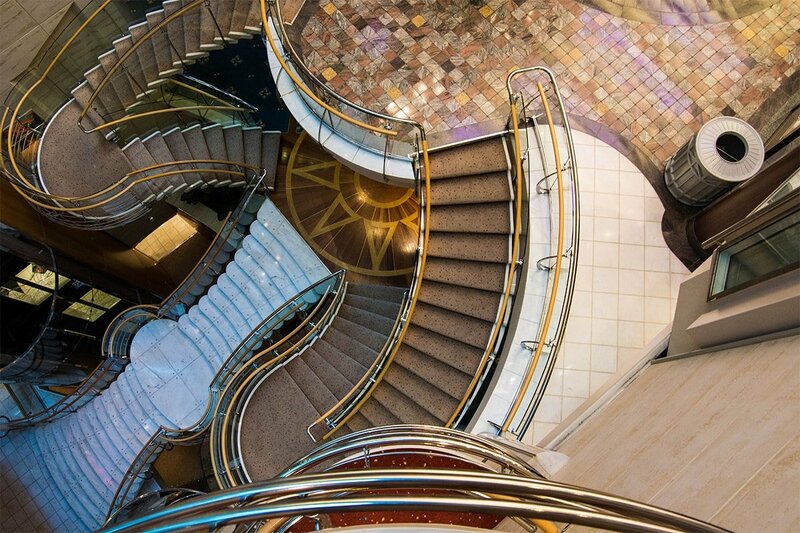 We move to Liberty of the Seas for this photo by Matt Meyers. Not only does he have a great first name, but got a very creative shot looking down a few decks. 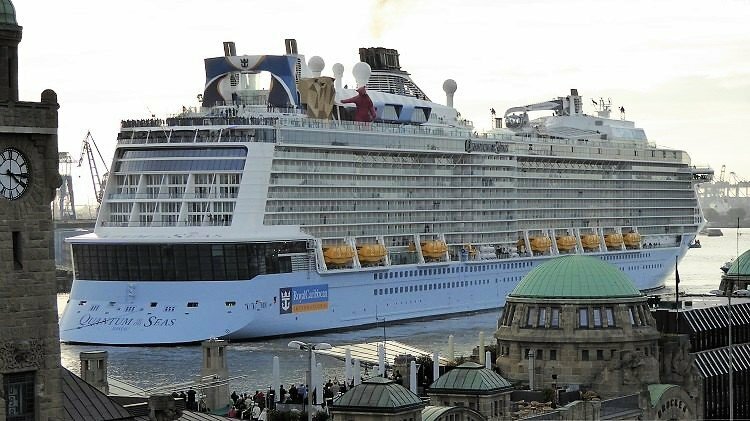 Our final photo this week is by Thomas Lemmer, and it is of Quantum of the Seas in Hamburg, Germany from back in 2014. Wunderbar! Thanks to everyone who sent in photos this week! If you would like to share your Royal Caribbean photos with us, be sure to use this form to send them and we will consider them for a future Friday Photos post! The weekend is here and we love celebrating the beginning of some well-deserved time off with a salute to great Royal Caribbean photos. Each week, we share our readers' favorite Royal Caribbean cruise photos for all to enjoy. 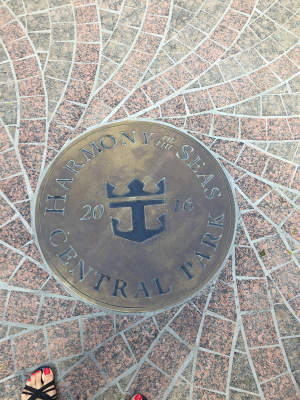 Our first photo is from Valerie Schuerlein from the platform that leads down the Ultimate Abyss on Harmony of the Seas. There is no turning back now! Here is a photo of Independence of the Seas and Brilliance of the Seas in Cozumel, taken by Kurt Stickler. 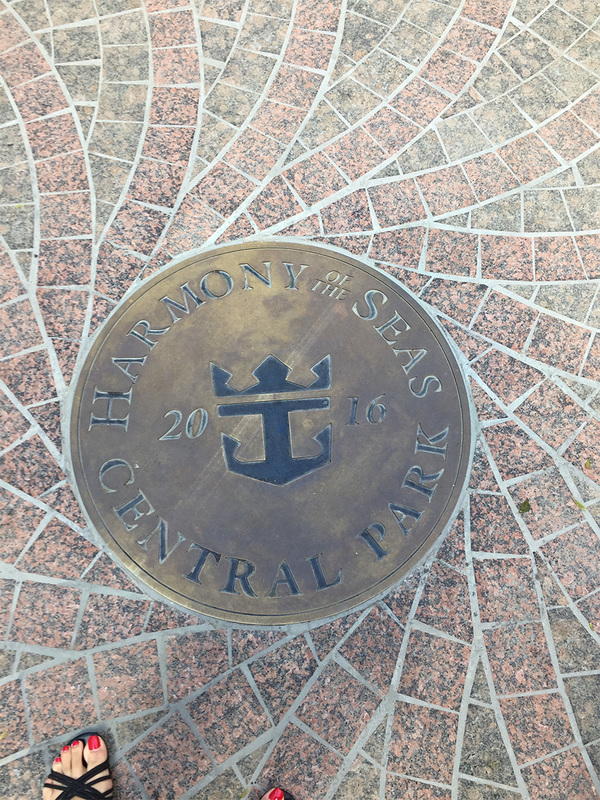 Lucille Mackie sent in this photo of Central Park on Harmony of the Seas. This seal is located nearly in the middle of the neighborhood. Check out this sunset photo taken on Anthem of the Seas by Eric Hoefman. 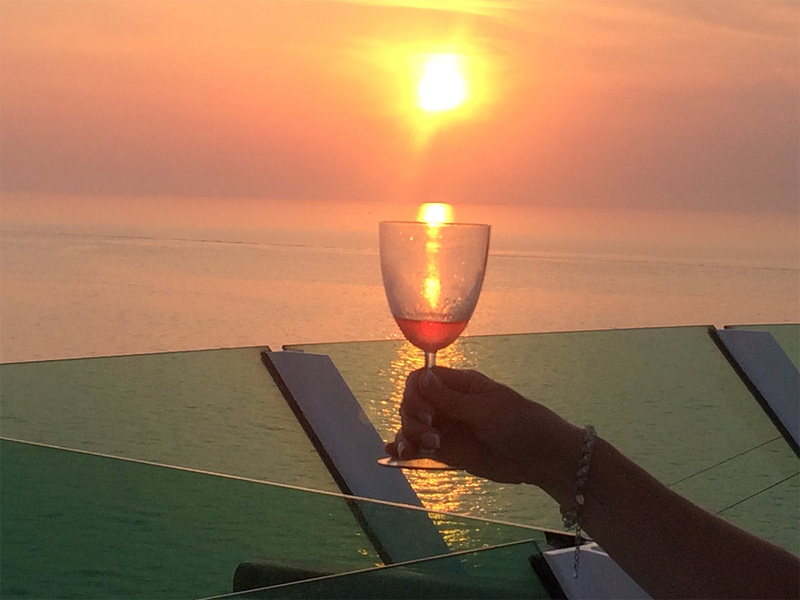 There are few experiences that can equal the splendor of a sunset at sea. 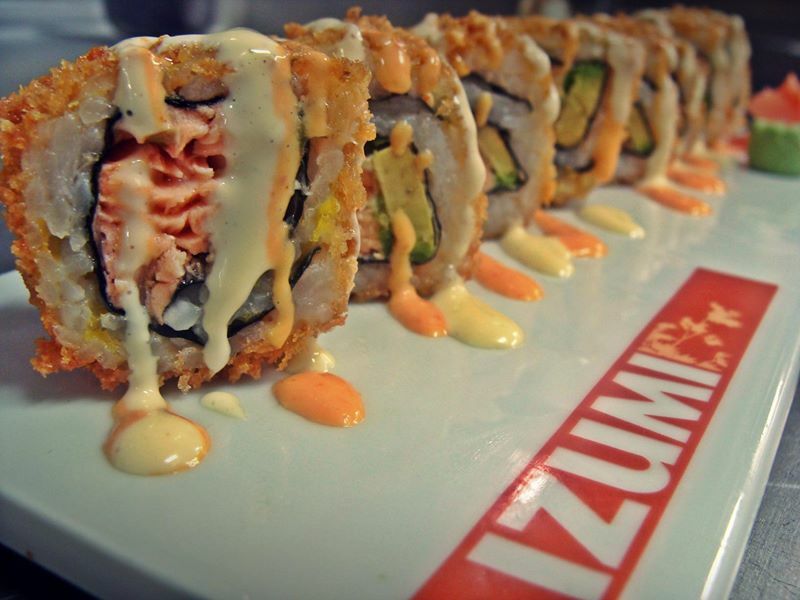 Dash Ramas sent in this photo of the Crispy Philly sushi roll from Izumi and now I am hungry. Here is a shot of Duskey Sound, New Zealand on Ovation of the Seas. Bramwell Bust took this photo and evidently the weather here does not always allow cruise ships to make it into this port. We wrap up this week's edition of Friday Photos with a photo by Kevin Chapman from onboard Brilliance of the Seas as they sailed away from Pisa. Perfect! Thank you to everyone for the fabulous photos in this week's edition. If you want to share your best Royal Caribbean photos, send them to us by using this form. Happy weekend! The weekend is here and that means it's time to share your Royal Caribbean photos! 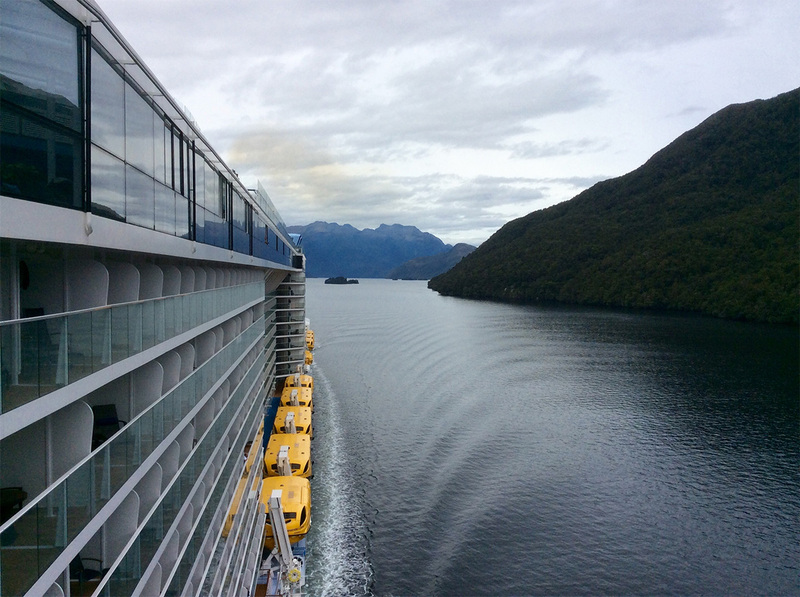 Each week we invite our readers to share their favorite Royal Caribbean photos with all of us, so here we go! 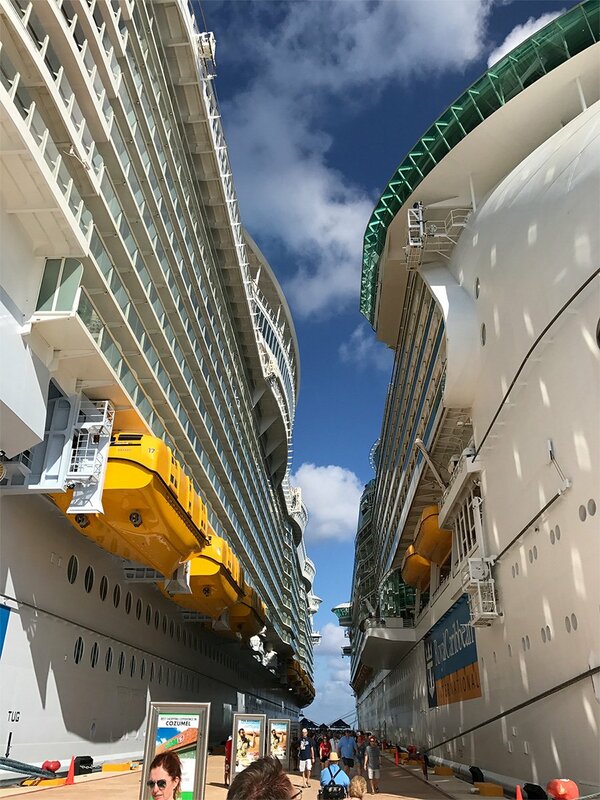 We begin our photos with this shot by Valerie Schuerlein "holding up" Oasis of the Seas and Allure of the Seas, while onboard Harmony of the Seas. Here is Quantum of the Seas in Labadee, taken by Alberto Bolognesi. Here is a shot of Quantum's sister ship, Anthem of the Seas, by Eric Hoefman off the coast of CocoCay. 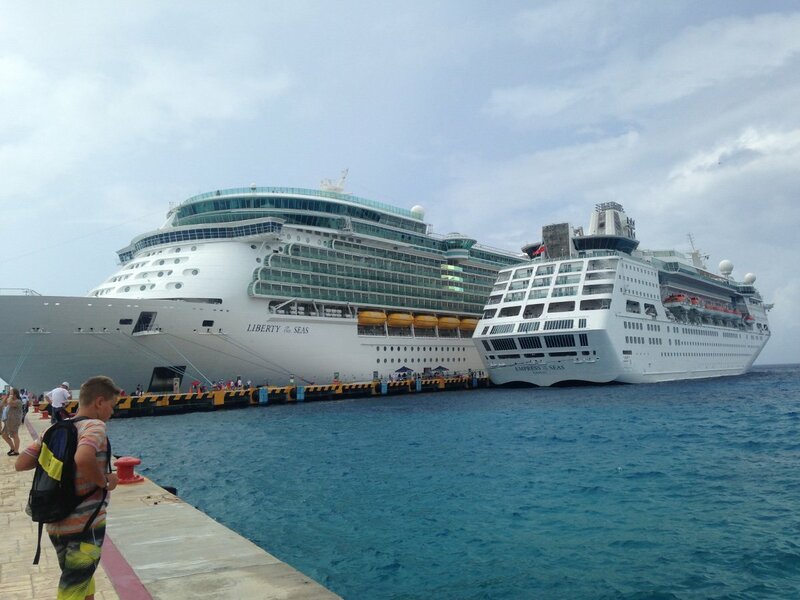 Megan Mathews sent this photo of Empress of the Seas next to Liberty of the Seas in Cozumel. Quite a difference in size! 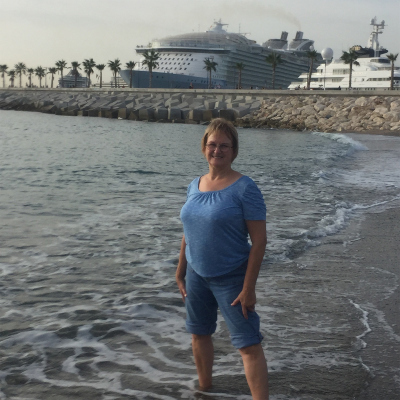 Here is a look at how Becky Bowen spent one evening on Allure of the Seas. She has my seal of approval! Here is another photo from two Royal Caribbean ships in Cozumel. This one is by Michael Bonham of Allure of the Seas next to Liberty of the Seas. 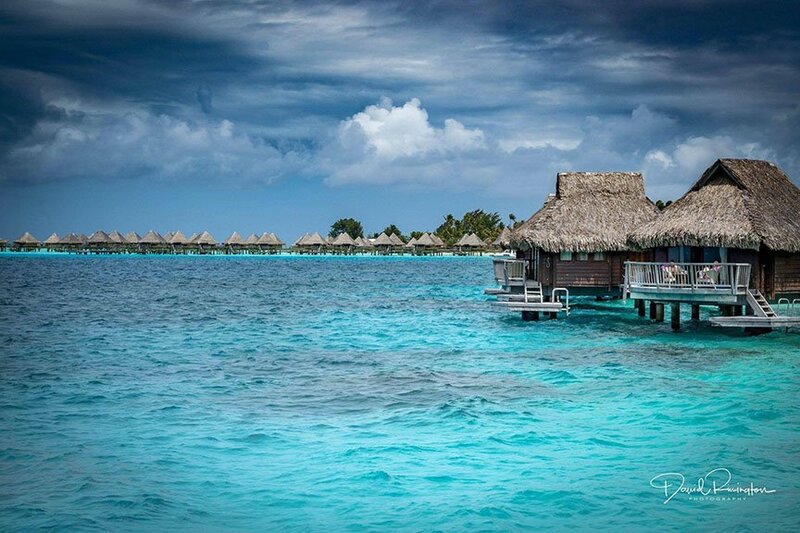 Dave Rimington took this photo from Bora Bora while on Radiance of the Seas. Definitely looks like another beautiful day in the South Pacific. I think this was a great collection of photos this week and of course we want to see your photos too! Use this form to send us your best Royal Caribbean photos and we will feature them in an upcoming blog post! Friday is here and we are sharing our readers' favorite Royal Caribbean photos, because who does not enjoy a "virtual escape" to a Royal Caribbean cruise? Put your sunglasses on in your cubicle, and enjoy this week's edition of Friday Photos. 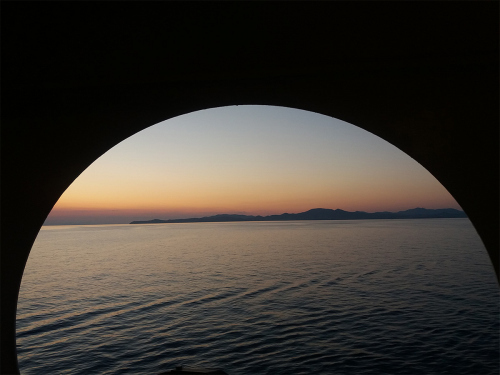 Our first photo is from Fatima of sunset in the Mediterranean while aboard Rhapsody of the Seas. Here is a great shot of the water slides on Harmony of the Seas by Sarah Plazak, which was taken shortly after Harmony of the Seas left port in Port Everglades. 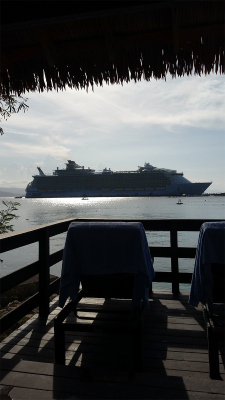 Lynn Thomas sent this photo of Oasis of the Seas while docked in Falmouth, Jamaica. Look at the size of the ship relative to the buildings in the port! Here is the view from Cynthia Barbour's cabana in Labadee, which looks like the perfect way to spend the day. In fact, it is my favorite spot on Labadee! 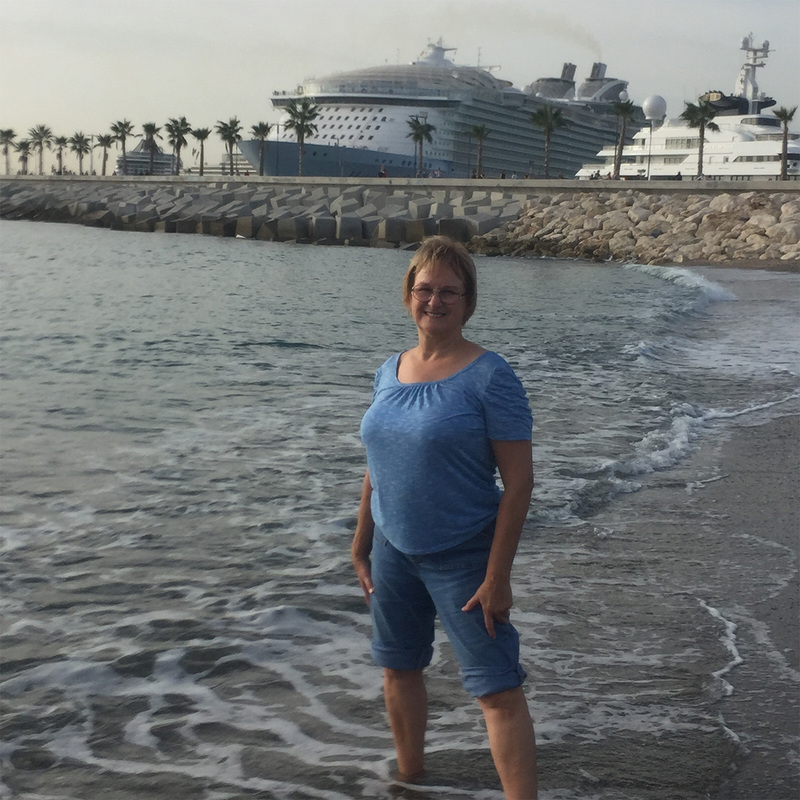 Our next photo is of Susan Widdowson dipping her toes in the Mediterranean, right before Harmony of the Seas made her transatlantic crossing. 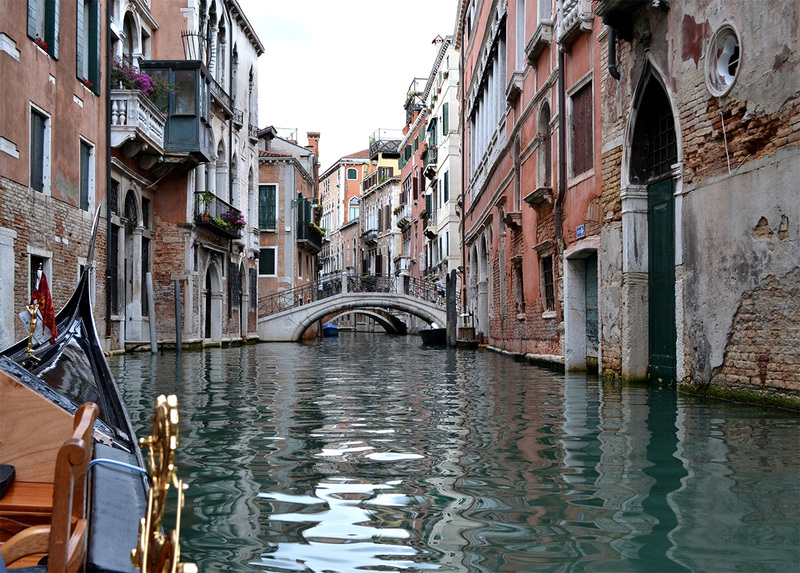 Here is a photo from a gondola excursion through the canals of Venice that D J Ep took last year. We wrap up this week's edition with this photo by Mark Reed and his girlfriend on their first day on Harmony of the Seas. Thank you to everyone who shared their Royal Caribbean photos this week, and if you want to share yours, please use this form to send them in for a future Friday Photos post. Happy weekend!